First up, a birthday present for my dear friend Julie. 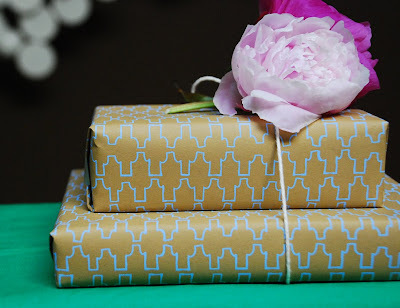 I finally got a chance to use my wrapping paper from Riffe Raff. Julie is definitely worth stellar wrapping paper! i never spend the time wrapping things properly, but it really does make a difference. beautiful job you've done here! Doesn't it feel great to share good wrapping paper with those who truly appreciate it? There are only a small handful of people in my life who are worth the good paper! And the purse and shoes are so lovely, I can't fault you for buying them. Especially at 75% off. what a treat! i love wrapping! Love the purse and shoes. Great buys! I'm salivating at the sight of those shoes!! Well done! Love- love that clutch! What a great statement piece! I am so glad there isn't a Barney's here in Canada, because from what I've heard about their blowout sales, I'd be living wearing fantastic clothes and living in a cardboard box. Those shoes are really adorable, and the purse so simple and summery! Nice scores. Lovely, lovely shoes. Simply stylish clutch. You may have saved 75% off the items, but now you are going to have to drag your sassy self out on the town to show them off. That is bound to set you back. Never mind, I am just envious. WHO makes those shoes? Love the neutral color and the design that's so...not! What a beautiful package hun! Lucky,lucky friend~ And those are fantastic shoes and a fantastic bag! I love 'em and glad you got some things you love! What pretty paper! Presentation certainly makes all the difference! what a lovely wrapped gift! and great shoes!! Those shoes are just awesome. I would never take them off my feet! Who makes those?!? I LOVE those shoes. They're fantastic! LOVE the wrapping paper! what a beautiful present! and the shoes! gorgeous. I love the purse! So pretty! nichole and kate -- it sounds so much fancier than i am, but the shoes are by Givenchy. Good Lord. I LOVE those shoes!! Just found your blog...it's great! Love both the shows and the purse - great purchase! GREAT shoes! they are really fabulous (as is your blog). keep it up!